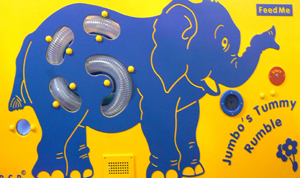 Feed the jolly elephant with soft balls, hear him trumpet, watch the balls go through his ‘insides’ and wait for the funny noise when they emerge at the end! Makes children and adults laugh out loud. Indoor Use Only, Power supply required.